A drill motor is designed to convert electrical power into mechanical motion. The market is filled with a wide variety of motors that can handle different applications and varying power requirements. The two most common types of motors include brushless and brushed motors. Although they are based on the same physical principles, their structure, performance and control differ significantly. See Our Our #1 Brushless Drill that has a 4.7 out of 5 stars rating and nearly 300 customer testimonials. The brushless motor, which is increasingly becoming popular with DIY and professional users is not new to the market. To understand its origin, it is important to look back to inventions by Mr. Ernst Werner von Siemens in 1856. Although rudimentary, the inventions have undergone a number of improvements over the decades, one of which was a rheostat for precisely controlling the rotational speed of the shaft. The brushless motor’s journey to prominence began in the early 1960s with the arrival of a power dimmer that had the capacity to convert alternating current (AC) to direct current (DC). In 1962, T. G. Wilson and P. H. Trickey published an article describing a brushless motor operating on direct current. The units were equipped with a technology that leveraged magnetism and successively opposed by an electric device. The major revelation behind the concept of the brushless motor was the absence of a physical switch to transmit the current. However, it was not until the 1980s that the brushless motor really got off to a good start. The greater availability of permanent magnets combined with high-voltage transistors has allowed this type of motor to generate as much power as brushed motors. Improvements to the brushless motor have continued unabated over the last three decades. This has transformed the way drill manufacturers produce efficient drilling tools. In turn, customers are taking advantage of key benefits associated with variety and reduced maintenance requirements. How does a drill motor work? The main difference between brushless or brushed drill motors is that the brushed variants are made of carbon while the brushless units use magnets to generate power. For this reason, brushless motors are better adapted, generate no friction, produce less heating and provide better performance. In addition, brushless units significantly reduce maintenance, which comes down to dusting and there is no need to replace worn brushes. In a brushless motor, the commutation of the windings is not mechanical but electronically driven by a device known as a controller. This transforms the DC current into a three-phase variable-frequency current and supplies the motor coils successively to create the rotating field. It is understandable that with this power principle, the coils are fixed in the motor and do not rotate as in brushed motors. All the brushless motors have a relatively similar design. They come with a fixed stator, which holds the coils and a mobile rotor on which the permanent magnets are glued. The windings can be built in different ways either in the form of a star or triangle. The majority of brushless have an internal rotor that turns fast up to 100,000 rpm. Brushes are essential for the proper functioning of brushed motor tools, such as drills, jackhammers, planers, hedge trimmers and grinders. Carbon brushes are chosen according to the brand and type of tool. They are installed on the fixed part of a motor to ensure optimal transmission of power to the rotor (the rotating part). They provide switching without the spark. Working in pairs, these components are wearing parts and subject to friction. The carbon brushes are in permanent contact with the slip rings. Made of graphite, these components come in different types. They can be equipped with a spring, a connector (a wire with plug) or without a brush holder. The brushes come in different sizes and shapes (square, rectangular mainly) and may have grooves to improve guidance. The speed of the drill is specified as part of torque, which depends on the strength of the magnetic field. Spring-loaded carbon brushes are secured to a spring that is equipped with a plate to ensure the smooth passage of power. In some cases, the brushes are mounted on a brush holder incorporating a spring that is designed to boost thrust. On the other hand, breaker brushes are used to stop the operation of the motor and ultimately the drill before the complete wear of the graphite material. This is aimed at maintaining optimal performance. Manufacturers of portable power tools, including drills, typically sell brushes that are compatible with their machines. The dimensions are expressed in millimeters or inches, which represent the thickness, depth and the width. However, these specifications may vary from one manufacturer to another. Although brushed motors are inexpensive, reliable and have a high torque or inertia ratio, they also come with a number of disadvantages. These components wear out over time producing dust. This type of motor requires regular maintenance to clean or replace the brushes. They also have low heat dissipation capacity due to rotor limitations, high rotor inertia, low maximum speed, and electromagnetic interference (EMI) due to arcing on the brushes. The operating principle of brushless motors is the same as motors with brushes (switching control using the internal shaft position feedback) but their overall design is different. The design of the brushless units reduces internal resistance and helps dissipate the heat generated in the stator coils. The efficiency is thus better since the heat of the coils can dissipate more efficiently thanks to the much larger stationary motor casing. Unlike the brushed motor, the permanent magnet on the brushless unit is mounted on the rotor. The stator is grooved rolled steel and contains the windings of the coil. On the other hand, the brushed units require few or no external components and therefore work well under restrictive conditions. What is a Brushless Drill Motor? When looking to understand what does brushless mean, it is vital to consider the basic design of these motors. The windings of the stator can be arranged in star (or Y) or in delta. Steel rolling can be performed with or without grooves. A drill motor without grooves has a lower inductance. It can, therefore, operate faster and cause fewer ripples at lower speeds. Its major disadvantage is higher cost factors since it is necessary to multiply the windings to compensate for a larger airspace. The number of rotor poles may vary depending on the application. More poles increase the torque but reduce the maximum speed. The material used to make the permanent magnets also has consequences on the maximum torque, which increases with the flux density. Since the switching must be performed electronically, the control of a brushless motor is much more complex than on the simple schemes associated with the brushed units. Both analog and digital control methods are used. The basic control block is similar to that of brushed motors but a closed loop control is mandatory. Three main types of control algorithms are used on brushless motors: trapezoidal commutation, sinusoidal commutation and vector (or field-oriented) control. Each control algorithm can be implemented in different ways depending on software coding and hardware design. Each offers specific advantages and disadvantages. Trapezoidal switching requires the simplest circuitry and control software making it an ideal solution for entry-level applications. It uses a six-step process using rotor position feedback. Trapezoidal switching effectively controls the speed and power of the motor but suffers from torque ripple during switching, particularly at low speeds. Sensorless switching (estimating the rotor position by measuring the back EMF of the motor) provides impressive performance at the cost of greater complexity of the algorithm. By removing Hall effect sensors and their interface circuits, this sensorless switching reduces component and installation costs and simplifies system design. This helps answer the question, what is a brushless motor? Brushless motor technology not only improves the power of your cordless power tools but also extends their working life. With these motors, you will have virtually no maintenance worries. The advantages of brushless technology are numerous. The absence of brushes eliminates problems associated with overheating and breakdowns. The service life of the brushless motor is therefore related only to the bearings. The brushless motor is more compact and two to three times lighter than brushed units. This improves portability in addition to reducing vibration and noise. Electronic commutations allow precise positioning. The motor achieves speeds of up to 50,000 rpm with optimally balanced rotors. The electronic module provides more flexibility with a wider range of variation and especially the maintenance of torque from the start. Without friction between the rotor and the stator, the efficiency improves significantly. Heat and friction are reduced while the energy of the battery is optimized. This increases the power and autonomy by up to 25 percent with conventional batteries. According to manufacturers, the latest generations of Li-Ion batteries provide up to 50 or even 60 percent of increased autonomy. The absence of friction allows the motor to operate without producing sparks even during intensive applications. The brushless technology does not have a contact zone, which considerably reduces wearing and maintenance. 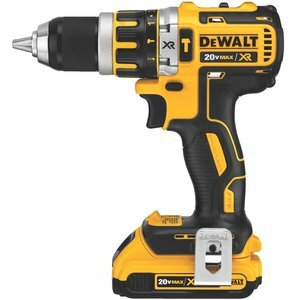 This offers several advantages: the motor is more energy-efficient, prevents overheating, eliminates the need to replace the brushes and users enjoy a longer battery life – you will find that the best cordless drill operates on a brushless motor. Brushed vs Brushless Motors: Why the Extra Cost? In a conventional electric motor, the rotor (rotating part of the machine) is driven inside the stator (fixed part). Both are connected by an electrical connection: the collector or commutator, which is in contact with small carbon brushes. With brushless technology, the rotor consists of magnets and the stator of coils that are alternately charged positively or negatively. Thus, the poles attract and repel allowing the motor to turn. The advantage is that there is no physical contact between the rotor and stator. The energy passes from one to the other through magnetism between electromagnets. Powered by a direct current, the motor operates with an alternating current produced by an electronic card that transforms the direct current into three-phase variable frequency. Thus, the coils are fed alternately to create a rotating field and thus the rotation. The electronic module, built into the motor or in a housing continuously regulates the current so that the motor operates at maximum efficiency. This improves overall performance and thus provides real value for money. 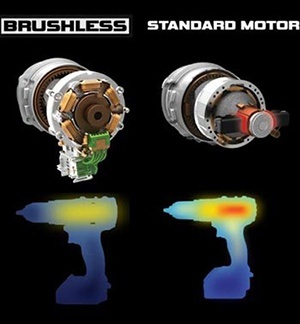 Which is better: brushless vs brushed motor? In summary, brushless motors are better than brushed units. Users can take advantage of reduced maintenance, improved efficiency, reduced heat and noise. The brushless motors are synchronous units with one or more permanent magnets. Power tools with a brushless motor are now considered high-end products. A DC motor consists of two electrical parts: the stator and the rotor. When powering the motor, it creates a magnetic interaction that sets the motor in motion. When you reverse the direction of the voltage that powers the motor, it turns in the opposite direction.